I read this last night and my hands have just now stopped shaking enough for me to post it. DME have confirmed that Nuclear Assault are coming to Dublin in 2015 and (get ready thrash fans) they’re going to be supported by Gama Bomb, Psykosis and Animator – Seriously! 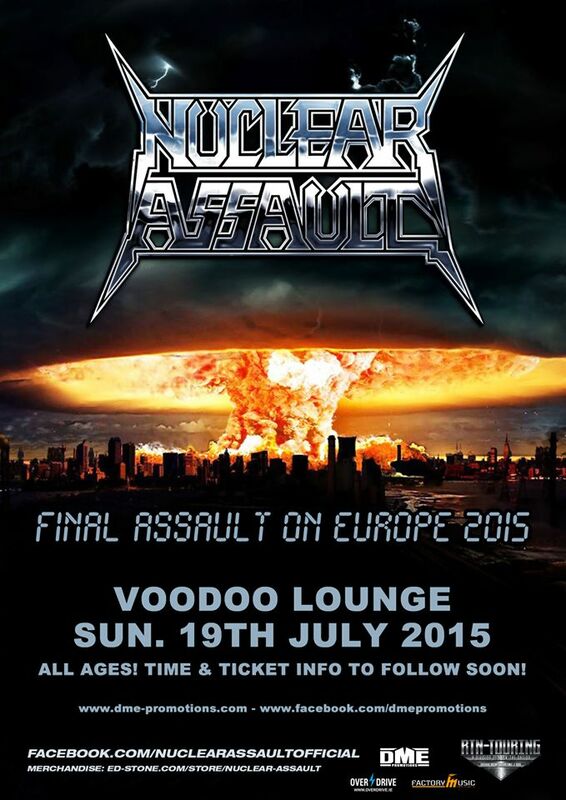 All four of these bands will be playing together on one incredible night at the Voodoo Lounge on July 19th as part of Nuclear Assault’s Final Assault on Europe tour. No ticket details have been released yet but who the hell cares how much it costs? It’s happening and there’s no two ways about it. Not only Animator and Psykosis, not only Gama Bomb – but freakin’ Nuclear Assault as well! What are you even supposed to do with that? Anyways, expect a messy Tickets There, a lot of beers, denim battle vests and savagery. If time allows, there may even be some tunes. This entry was posted on November 27, 2014 at 4:59 pm and is filed under Gig Listing, News with tags Animator, Dublin, Gama Bomb, Nuclear Assault, Psykosis, The Voodoo Lounge. You can follow any responses to this entry through the RSS 2.0 feed. You can leave a response, or trackback from your own site.